This book takes an interesting look at one of history's greatest authors. Jane Austen has arrived at Scargrave at the request of her friend, Isabel, the new Countess of Scargrave. The Earl and Countess have been married for three months and have just returned from their honeymoon. The Earl is throwing a ball in his bride's honor and she wants her dearest friend there to celebrate with her. However, tragedy befalls the Earl during the party. He becomes very ill and eventually passes away. Soon it is realized that the Earl's death was not an accident but murder. Now suspicion falls upon Isabel and the new Earl, who she has had an intimate relationship with, and Jane must work to save her friend and the Earl from the gallows. This is the first book of the series and it is pretty good. It is written in journal form which I really like. Barron gives a lot of footnotes so the reader can learn about the lingo and traditions of the era. It was slighly slow for my taste but I still read it fairly quickly. There are nine books in the series so far and I think I will read the second one as soon as some other books are off my list. 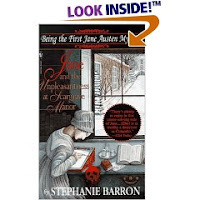 If you like Austen and mysteries then you may enjoy this book.